Successfully Added DOOGEE X3 Smartphone - Android 5.1, Bluetooth 4.0, Smart Wake, Gesture Sensing, 1800mAh Battery, Dual SIM (Blue) to your Shopping Cart. The DOOGEE X3 is an entry level compact smartphone with a very attractive price. It comes with a 4.5 inch screen, Android 5.1 operating system, Smart Wake, Gesture Sensing and more. 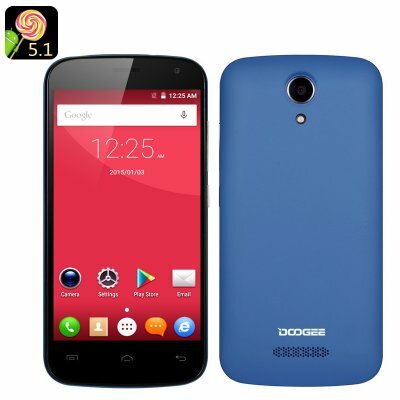 The DOOGEE X3 is a budget smartphone with a compact screen – 4.5 inch with a 854x480 resolution. One of the major perks of the smartphone is that it comes with Android 5.1, sporting lots of cool upgrades from previous versions. Moreover, it supports two great navigation shortcuts: Smart Wake and Gesture Sensing. Smart Wake lets you access selected apps directly from the locked screen by simply drawing a corresponding letter (f.i. “C” for Camera). Gesture Sensing lets you use hand movements to enable certain actions on your smartphone: move between apps, skip music tracks and more. The smartphone comes with 8 GB of internal memory and you can expand that with a 32GB SD card. The 1800 mAh battery give you up to 6 hours of continuous talk time and 48 hours on standby. The DOOGEE X3 also sports Bluetooth 4.0 for efficient communication with other devices, two camera, two SIM cards and supports Wi-Fi tethering. All in all, the DOOGEE X3 Android smartphone is a great choice for those who are looking for more than average functionality at a budget price. With a nice set of features and an efficient Android interface, the smartphone does get the job done.